For the second time since 2012, the Supreme Court will hear oral arguments in the Fisher v. University of Texas case on Wednesday. The case targets a race-conscious admissions program at the University of Texas. 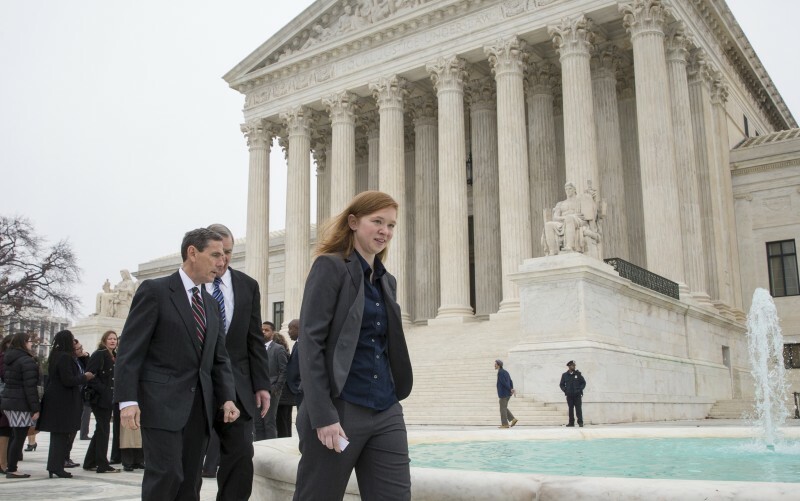 Plaintiff Abigail Fisher, a white woman, was denied admission to the University of Texas at Austin in 2008, and has since maintained the race-conscious program unconstitutionally privileges members of some racial groups. Northeastern University law professor and WGBH News Legal Analyst Daniel Medwed spoke with Morning Edition host Bob Seay about the case and the impact it could have on schools in Massachusetts. Several years ago — in response to nation’s history of racial discrimination and segregation, and aware of the lingering consequences of that history — many public universities set about to take affirmative steps to diversify their student bodies. Some of these programs took the form of explicit quotas designed to ensure that a particular percentage of minority groups were represented in the student population. Unsurprisingly, some white applicants who were denied admission during this era, filed lawsuits claiming they were deprived of their constitutional rights to equal protection under the law. In 2003, in the seminal U.S. Supreme Court case Grutter v. Bollinger, the court struck down the use of this type of racial quota. But, notably, the court noted diversity as a fundamental value in higher education. In turn, admissions offices revamped their policies, moving away from quotas to a more holistic process in which race among many factors could be treated as a positive factor in the process. Abigail Fisher’s argument goes something like this: while Texas, after the Grutter decision, abandoned the use of expressed quotas — so-called quantitative diversity — the system that it put in its place achieved, functionally, the same result. She argues it privileged certain racial groups over others, and that she was disadvantaged under both systems. The University of Texas, in turn, is taking issue with the idea that it’s looking at this in the form of groups. Instead, university officials are claiming that the admissions process is an individualized process; that each individual application is being scrutinized, and that race is among a series of attributes that are taken into consideration. Even more, the university is claiming that racial diversity is fundamentally good and that having a diverse campus helps to break down racial stereotypes and promote cross-racial understanding. This is a puzzling case for two reasons: first, Abigail Fisher is not an idea plaintiff. She’s appeared before the U.S. Supreme Court before and it’s quiet unusual for the Supreme Court to give litigants a second bite at the apple. Moreover, she was not a good candidate for admissions to the University of Texas to begin with. She had poor grades and weak test scores. It’s far-fetched to think that she would have been admitted under any admissions policy at the flagship university of Texas. Additionally, she may not have what’s called “standing to proceed.” She was denied admission more than seven years ago and went on to pursue her undergraduate degree at Louisiana State University. So there’s a question as to whether the case is moot; what kind of relief could you give her when essentially time has passed. Second, given this complicated back-story, pundits have speculated as to why the court even took this case, and some people think that it may be a sign that the court’s conservative wing may be looking to get rid of affirmative action as we know it. Boston is the quintessential college town. Higher Education is a major industry here – perhaps the major industry. Fisher’s case is an explicit challenge on the affirmative action programs of public universities, so if she were to prevail, it could put pressure on the University of Massachusetts system and other public institutions to immediately revise their affirmative action policies. Private colleges would also have to respond because almost all of them accept federal funding. Therefore, private colleges could be forced to completely revamp their entire affirmative action programs. This would mean that we would have a very different admissions landscape in our community and potentially a very different student body. This story appears courtesy WGBH’s On Campus blog. Reproduction is not permitted.